Is there anything better than a bowl of curry to make you feel good? 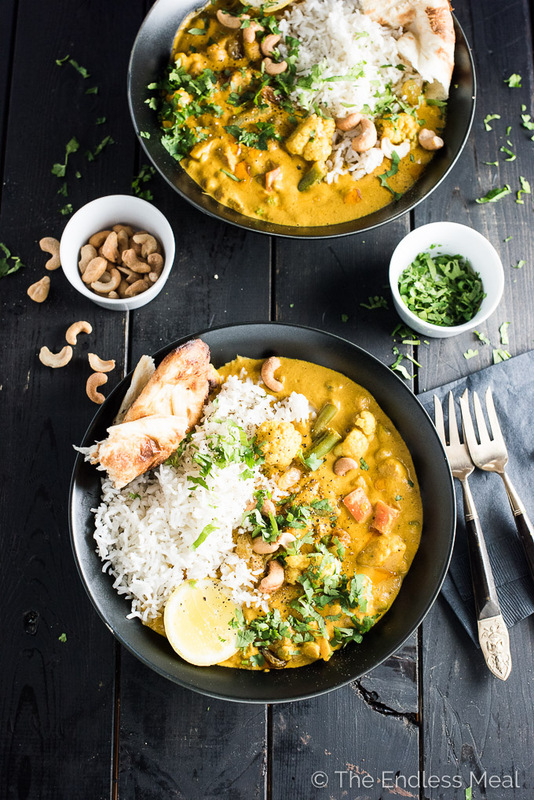 Indian is some of my all-time favorite comfort food, and a vegetarian korma is right up there with my fav curries. Butter chicken (or even Vegan Butter Chicken) is another fav. It's so hard to choose my #1 favorite dish. Are you the same way? Seriously, if I had to choose a last meal, I'd never be able to. I'd want Indian curry, Thai curry, some Chinese food for sure, Mexican (obvs! ), a giant pan of lasagna and some Greek food. There's clearly too much delicious food out there. How's a girl to choose her fav?!! The thing I love about making vegetarian korma (aside from the fact that it is SO EASY to whip up last minute) is that the recipe is really flexible. 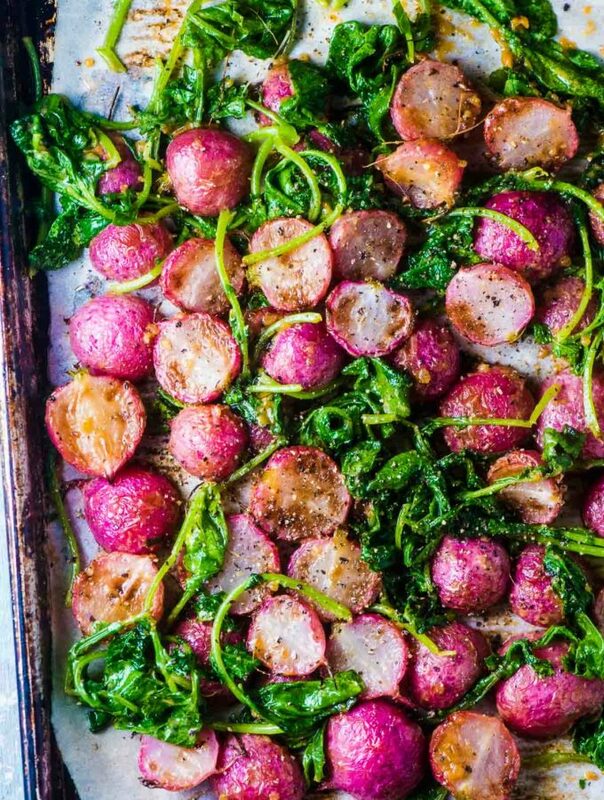 You can mix and match the veggies and use whatever you like and have on hand. I sometimes like to add some medium tofu to the mix. It has a texture similar to the Indian cheese, paneer. If you want to make this into not a vegetarian korma, you could definitely add some chicken. I love to serve this with some quinoa on the side, but my handsome man prefers traditional basmati rice. He usually wins. One thing we always do is order some naan to go with it. There's little Indian restaurant at the end of the block that makes great naan, but terrible curry. Seriously, it's so bad that the one time I ordered it I couldn't even finish it. It was completely flavorless. Anyway, we always order naan from them, and I think they laugh at our weird takeout order every time. Curry has always been feel good comfort food in our house. It's a go to dinner when we want something familiar and warm. It's also super easy to make and next to impossible to mess up. If you ran out of one of the spices, you can always add a little extra of another spice. 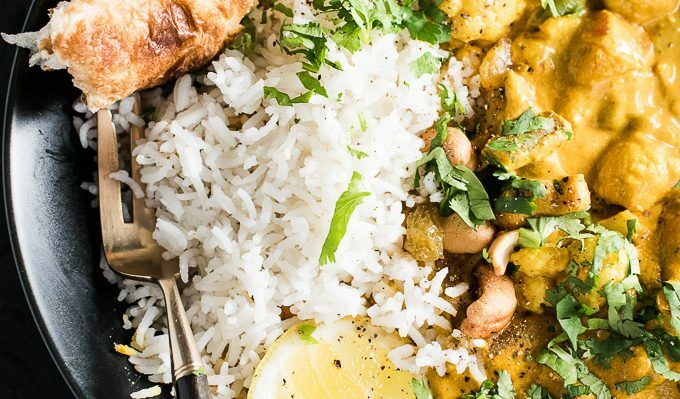 Curries, like this vegetarian korma, are flexible and you definitely don't need to stress over them. Most of the time, I add coconut milk to my curry recipes. We love how creamy it makes the curry without having to add any dairy. It also adds a delicious flavor that we can't live without. 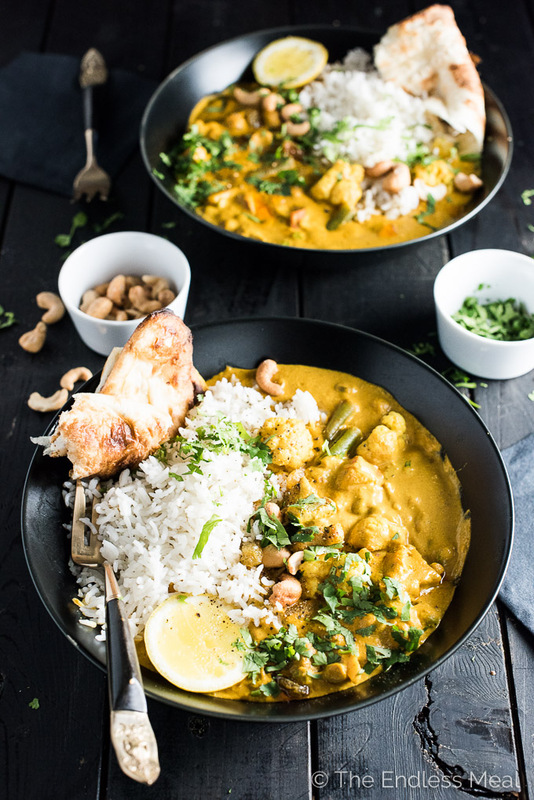 We like to top the vegetarian korma with some crunchy cashews, sweet raisins, and a little lemon. I've listed them as optional ingredients, but I wouldn't recommend skipping them. They're my favorite part! I’ve made this over five times now and it really can’t be beat! I love it more than my favorite take out!! My family was so impressed. Making it again this weekend for my parents! A minute of silence please! Amazing Recipe. Love it!!! Thank You. Will check you out for more recipies. P.S I add tofu to mine… yummy!! Hahah I LOVE it!!! So happy it was a hit! 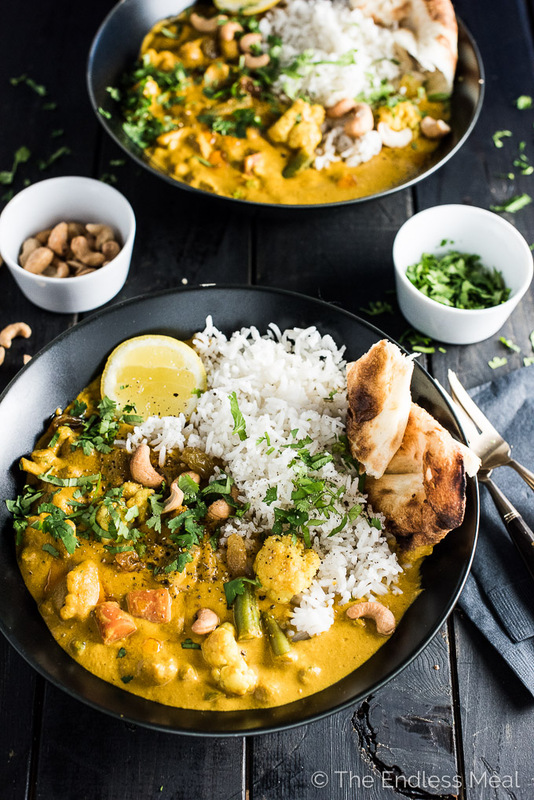 I make a lot of Indian food – this is the best vegan korma recipe I’ve ever tried, let alone made! Wow thank you so much! I’m really happy to hear the recipe was a hit!! We are having a vegan house guest so I thought this would be a great recipe to try. Could you tell me, is it very spicy? As much as I like spice, I’m not sure if everyone else does. So many spices and amounts of them was to much. Mush of flavor. Didn’t really get a good taste of a certain flavor of spice. Also directions don’t make sense unless I am just not understanding “Working in batches, blend the curry until it is smooth then add it back to the pot.” but in #3 everything was already in the pot … so how do you work in batches and then add it back to the pot ?? When you’re making this curry you’ll have two pots on the stove. One for the veggies and one for the sauce. You blend the sauce (in batches, unless you have a large blender) and once it’s smooth you add the cooked veggies into the sauce. I’m sorry to hear you weren’t a fan. I think it’s a wonderful recipe! So rich and comforting. My wife and kids loved it too. I used cauliflower, haricots verts, carrots, a handful of raisins and some chopped fresh coriander. I will be making this for the family christmas dinner, leaving out the chili flakes and half the ginger as they’re not as used to spicy food as we are. Plus an accompaniment of naan bread, roasted almonds, coriander, mango chutney, greek yoghurt and basmati rice. What a great idea for Christmas dinner! I hope you have a wonderful dinner! Made this last night for dinner and it was SO delicious!! I skipped the yogurt and some of the spices that I didn’t have on hand, and then just added more of the others to taste. It was heavenly and so perfect served with brown rice and homemade paleo/vegan naan. Definitely a hit and will absolutely make again – it was so rich and flavorful. I’m so happy you liked the recipe! And I’m super curious about paleo naan. I hope you have the recipe on your blog!! Fabulous! Daughter’s moved back home and has turned veggie! Second time she’s made this for us and great to get her dad away from the “meat and two veg” syndrome more often. I wondered though if you can freeze (if any) leftovers as has coconut milk in it. We had it with onion bahjis and naan bread and so too much for the three of us. Early responses appreciated so dont have to dump it or give away! I’ve frozen it before and it worked well! Wowzers! Amazing recipe! Only a few tweeks to the recipe. Whole Foods has a curry powder which has every spice listed here, all in one jar! It is Muchi Curry seasoning and it is the one stop shop for all of those hard to find ingredients, such as the fenugreek. I didn’t add the fennel since my husband isn’t a big fan, but did toss in a hand full of chopped baby spinach and a few Thai chilies split down their middles. Supper is a happy happening place tonight! Thank you for the recipe! I’m so happy you liked it! And I’m going to have to keep an eye out for that spice mix. It sounds great! Hi, I’m going to make this tonight and I’m curious at what point I should add tofu. Thanks in advance! I’m super excited to try it. this was much easier than i expected it to be! I subbed the onion for leeks as thats what i had on hand. delicious. Hi! I’m about to make this recipe, but I have a question… is the fenugreek seeds or leaves? I have both, just wondering which one to go with, thanks! I’m a vegan girl from Denmark, and I made your recipe with some vegan adjustments yesterday, and oh boy, it was good. I skipped the cashews and added some almond cream instead. Furthermore, I used soy yoghurt and left out the fenugreek and fennel, since I didn’t have any. I served the dish with jasmin rice and topped it with chopped almonds, raisins and cilantro. My boyfriend and I loved it, so warm and spicy, the best Indian food I’ve made – thank you so much for sharing this recipe! Awww I’m so happy to hear you like it!! Made this last night and it was spectacular!! My husband and I go out for Indian food quite often, and this tastes just like a resturant dish! I’ll definitely be making it again! The only thing I think I’ll do differently is maybe soak the cashews overnight because the sauce was a bit “gritty” the first time around. Thank you for the delicious (and healthy) recipe!! 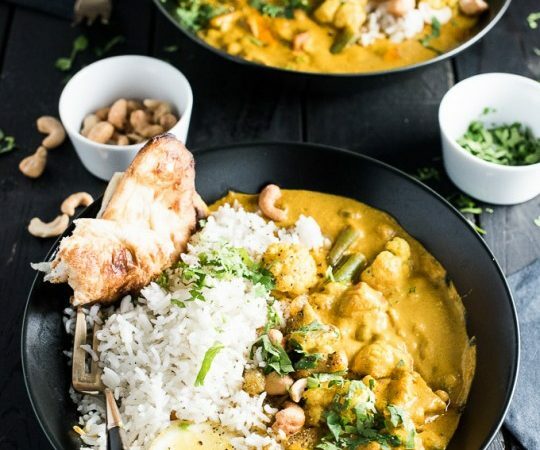 Hey, this South Indian Veggie Coconut Curry looking so yummy, we will try this at our restaurant in Brampton. Will let you know the feedback later. Cheers for nice info. Have made this 3 times now. I am a huge curry fan! And this is very authentic! Seems to have become the family favourite! Which is good, i don’t usually make kormas but this is really really good! Keep up the good work, will be trying the other recipes out for sure! Thank you so much! I’m so happy to hear you like the recipe!! I’ve just made this and followed it to the T and am desperately trying to save my huge pot due to the amount of cardamom! All I can taste is cardamom. I eat a lot of Indian and do you really think this amount of cardamom is correct? I like every other part of this recipe but I think .5 of a teaspoon of cardamom would be more than enough. I haven’t made this yet, but the amount of cardamom listed gave me pause too, as many recipes including cardamom cakes don’t even call for this much. I’ve found in particular there are varying degrees of strength to cardamom powders on the market. Mine is actually very potent (Frontier) so I would use maybe a 1/4-1/2 tsp for this recipe. But I’m looking forward to making this dish, it looks delicious. This is the best Korma I’ve ever eaten and I can’t belbelieve eve I made it! I used greek yogurt and ruined it 🙁 mistakenly grabbed the wrong yogurt out of the fridge. can’t get rid of the tang no matter what I do! Glad I tried this recipe on myself before making it for others!! I’ll try again another time with heavy cream or just regular yogurt. I’m so sorry to hear you didn’t like the tang of Greek yogurt! Still delicious tho!!!! Became a staple recipe already! Boyfriend loves it. It doesn’t specific but is the fennel whole or ground? So this is the second recipe I tried from your site. I tried the butter chicken recipe and it turned out fantastic, so when I was looking for a korma recipe, yours was the one I went to… and let me tell you, I am glad I did! I made a few minor adjustments- I omitted the fenugreek because I didn’t have any, I only used 1/4 tsp fennel because my husband isn’t a fan, and I only used 1/8 tsp chili flakes because my kids don’t like too much heat. I also didn’t have any cashews (which I would have added if I did) The vegetables I used were: 2 cups cubed squash, 3 cups cubed yam, and a 540 ml can of chickpeas because this was what i had in my fridge. Thank you again for such a good recipe! I’m so happy to hear you’re liking the recipes here! Hooray!! I made this for dinner and it was really great! So tasty and well balanced! I was a bit afraid that with the amount of spices it would be on the bitter side, but not at all. It was really good. I will make it again for sure. I used up all my veggies in the fridge: carott, red pepper, snow peas, peas, broccoli and cauliflower (cauliflower works really well in this) and served it with white rice. Get ya pretty darn close to what you taste from a true Indian cook. There’s just a few tweaks I wanna play with. I’m pondering heavy cream, and slightly less coconut milk. Also the lemon caught me strong up front, and the clove seemed slightly too present. There was a slight bitterness too that I couldn’t counter with more brown sugar, and I believe that’s from the turmeric. So I’m gonna play around a little next time, and if I hit anything killer, it’d be according to my girlfriend, then I’ll post my new thoughts! Really appreciate this information posted here! It still tastes great, I’m just an over thinker. I think the best part about cooking is playing around with recipes! Do let me know if you come across a killer combo! I just made this for my family, including the kiddos, and it was a big hit! Pure gold. Thank you for sharing the love. I’m so happy your whole family loved it!! Sounds amazing, can’t wait to try this! Thoughts on whether this would make good slow cooker/crock pot recipe? Like maybe at least tripling? Would love to make this for a giant group for a holiday party. Thanks!! If you were able to keep a close eye on it, it may work in a crock pot. Last year I tried many times to make a veggie curry recipe in a crock pot but the vegetables always got too soft and broke down to mush. I would be afraid the same would happen here. I successfully made in a crockpot yesterday! I added chicken and set it on low for 6 hours. About an hour in, I added the potatoes and veggies (potatoes probably needed the full 6 hrs 🙂 ). Veggies weren’t mushy at all. Great recipe!! That is so great to hear! Thank you so much for letting us know!! Hi Natalie! Very excited to see you made this in the crock pot! Nice way to meld the flavors together. Which veggies did you use? Just curious which I should pick so that they will cook in the 5-hour time that yours did also. Thank you! I’m curious … have you actually made the recipe? Or are you just letting us know the way that you prefer to make korma? I’m curious about that too. Wonder if Scott will reply. My family, including the kids. loved this. Adaptable and delicious. I check out you website often and can’t wait to try more of your yummy recipes! I’m so happy to hear you and your family enjoyed the recipe! Horray! This is delicious. I used up some coconut yoghurt I had in my fridge and omitted the sugar as the yoghurt was sweetened. I put half the sauce in the fridge and used the following day, it tasted even better after sitting overnight! Thank you very much for a great recipe.! Great call on the coconut yogurt! I’m so happy you liked the recipe! I was thinking of using soy beans and peas, should they be dried when they go in the pot, or cooked like from a can? 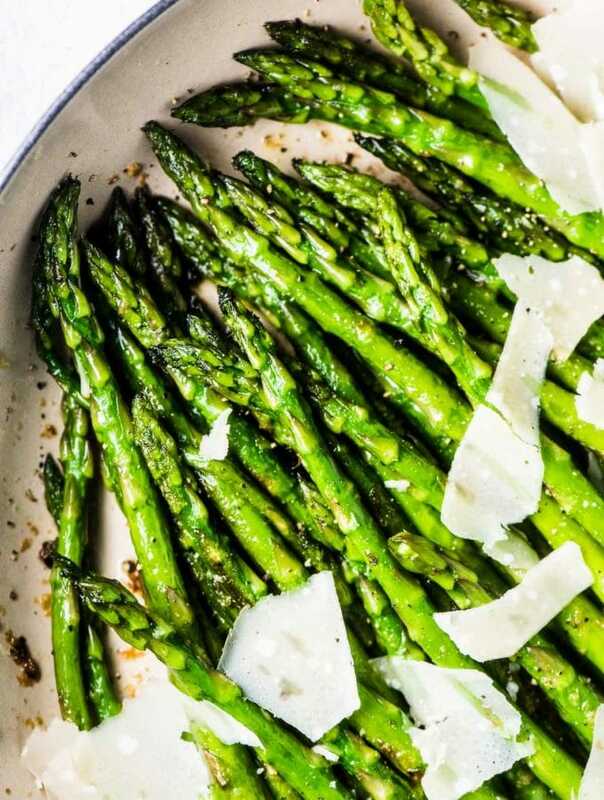 You’ll want to add them cooked! The clove is so overwhelming, it might just have to be thrown away. Would probably prefer it without the clove. Just made this, with some modifications, and it was a hit! Veggies took a lot longer than the time indicated to get soft enough to eat. I only used curry and garam masala, got very spicy. Didn’t have a full can of coconut, added cream AND creme fraiche. Didn’t have a blender, so I finely chopped garlic and ginger. Used less than the recipe amount of tomato paste, too. Still fine. I’d definitely make this again! Thanks for the recipe. Honestly, I am shocked that there are any negative reviews. This recipe got me the closest I’ve ever been to replicating restaurant quality Indian food! It is absolutely delicious. I didn’t have fenugreek or cardamom so just went without, and also left the yogurt out to make it vegan. It is so flavorful and creamy. I’m wondering if I can make the korma in advance and freeze it? I would LOVE to have this on hand on the regular. Do you use plain yogurt? Or does vanilla work? I just made this and wasn’t impressed. It’s way too full of spices for me. I added another can of coconut milk and some salt to make it passable. The sauce also seems very runny. I put the amount of spices in called for except for the fenugreek because I didn’t have it. Honestly, this recipe isn’t the best. It’s okay. But maybe I’m just used to having the real deal that takes forever to make. This immitation south Indian style korma will do in a snap though. I am curious, how is this recipe different from the ‘real deal’? What makes it so much more time consuming? I would really appreciate a recipe or a link just so I know what we’re talking about here. Thanks! hi, looks really good and planning on making this for dinner tonight and i was just wondering do i have to put yoghurt? i am a vegan and tbh never tried vegan yoghurt and not sure if they even sell it here… could i replace it with something else? Hi Chantelle! You can omit the yogurt. It’s still great without it! Made this last night for my family. They liked it but found it bland. Can you recommend other spices. I did add cayenne pepper. I’m sorry to hear you found it bland! There’s actually a lot of spices in here and I’d worry that it would turn gritty if you added more. Have you had your spices sitting around for a while? They do lose flavor if they’re not fresh. Hi. How do You Get IT more yellow? Ours turned pretty much red because of the tomato paste. Any tips? Oh shoot … I don’t. Did you change any of the spices? It’s always worked for me that the yellow/ orange curry powder, garam masala, and turmeric win out over the red tomato paste. I have some heavy cream in the fridge I need to use up, can I add that into this recipe? Use with the coconut milk or not? Hi Kristen, we made this last night and it was great. I did change the recipe a bit: I doubled the tomato paste and spices, used one larger sized can of coconut milk (565 ml?) and then added 1 diced sweet potato and some water with the coconut milk and cashews. I blended that for thickness and then added cauliflower, tofu and some mushrooms after blending and let them cook in the pot instead of boiling them separately (I was mostly trying to avoid having to clean a second pot). I then added some fresh spinach and the brown sugar. 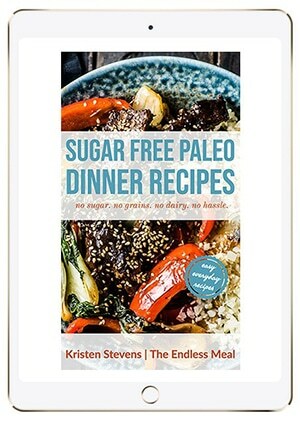 It was delicious – another great recipe from The Endless Meal! Thank you! So awesome! Love the changes you made … they sound delicious!! Do you think this could work with frozen vegetables?